Due September 28, “An American Treasure” marks the first release of Petty’s music since the Gainesville, FL singer passed away last October 2 at the age of 66 in a Santa Monica, CA hospital after being found unconscious and in cardiac arrest at his Malibu home. The 60-song box set will feature dozens of previously unreleased recordings, alternate versions of classic songs, rarities, historic live performances and deep tracks from the Florida rocker. The compilation was commissioned by Tom’s daughter, Adria Petty, and his wife, Dana Petty, and curated by Heartbreakers Mike Campbell and Benmont Tench and his studio collaborator, Ryan Ulyate. 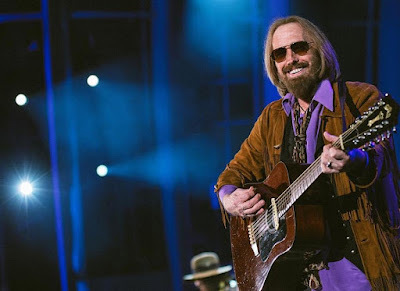 “Everyone involved in this project chose each track with tremendous care and deep respect for the body of work Tom Petty created over the course of 40 years,” explain the Pettys. “He also accumulated a wealth of unreleased music in his vaults, and we have collectively uncovered one gem after another that will keep us all listening and discovering new facets of Tom’s talent for many years to come. “An American Treasure” will be released in multiple formats, including a 4CD Deluxe Edition (see track list below), complete with a booklet of photos and liner notes for all songs; a 4CD Super Deluxe Limited Edition, which adds an expanded 84-page hardbound book and a newly-created lithograph of Shepard Fairey’s cover artwork alongside custom reproductions of Petty’s handwritten lyrics to four songs featured in this collection and a numbered certificate of authenticity; a 6LP set with booklet, available November 23; and, a 2CD Standard Edition delivering 26 career-spanning tracks.